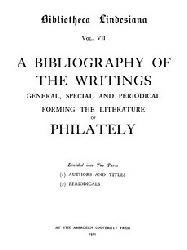 In 1911 the Aberdeen University Press published the product of Edward Denny Bacon's ten years of cataloguing work as Volume VII of Bibliotheca Lindesiana A Bibliography of the Writings General, Special and Periodical forming the Literature of Philately. This catalogue is crucial to using the library today. However, the original work is not readily usable as it does not give the all-important shelfmarks which allow the individual works referenced to be found. These shelfmarks were annotated subsequently in manuscript when the library was received at the British Museum in 1913. This marked-up copy is a most valuable finding aid, and was turned into a revised facsimile edition by The Printer’s Stone Limited in 1991. 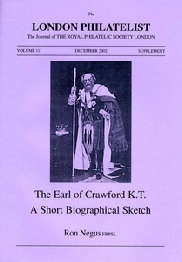 A copy of the 1991 edition has been digitised, and converted to a pdf which can be freely accessed from the Global Philatelic Library. This has been OCRd and can be searched from within Adobe Acrobat, but users should understand that the OCRing is not ideal and some of the small italic text in the original has not been perfected. The single file is large (42Mb) and may take a long time to download on some internet connections. Hence a series of smaller sections are available for those users who only wish to see specific portions of the catalogue. 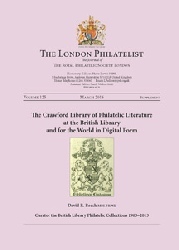 London Philatelist supplements from 2002 and 2016 can also be viewed by clicking on the images to the right.